As the willowy love interest of spinach-swilling sailor Popeye, Olive Oyl has earned her own place in comic book and animation history. Abnormally tall and rail thin, her distinctive appearance sets her apart from the rest of animated love interests in history; Olive Oyl is certainly her own woman. Here are ten lessons that generations of children have learned from watching her in action. You Are Not Defined By Your Significant Other – Though she’s now known almost exclusively for her decades-long turn as Popeye’s lady love, the character of Olive Oyl enjoyed reasonable popularity of her own for ten years before her sailorman was created. Materialism Isn’t Attractive – Ms. Oyl is often portrayed as a fickle, materialistic young lady whose affections are easily swayed by an expensive bauble in the early Popeye films. Watching this behavior in action is a great way for kids to see firsthand how unattractive such methods are. A Quick Temper Doesn’t Look Good on Anyone – Another early-days trait of Olive Oyl that can serve as a cautionary tale for young viewers is her rather nasty temper, which causes her to dole out slaps and other physical abuse without compunction. There’s More to a Person Than the Way They Look – In our beauty-obsessed culture, youngsters can take an extremely valuable lesson from observing the love that Popeye has for his largely unattractive Olive Oyl, and realizing that beauty really is only skin deep. Choosing the Bad Guy Usually Leads to Trouble – Plenty of girls out there have a soft spot for the bad guy; however, watching a Popeye short or two might be enough to clear it up. Whenever Olive Oyl gives bad boy Bluto a shot, it inevitably ends in violence. Clothes Don’t Make the Woman – Fashion labels are of absolutely no importance to the dowdily-dressing Olive Oyl; this can also serve as a lesson about just how unnecessary such high-dollar clothing is. The Love of a Good Man is a Valuable Thing – One of the most valuable lessons kids can learn from observing Olive Oyl and her choices is that the love of a good, strong man who respects you is better than the violent, ham-fisted affections of an oaf. Some People Create Their Own Problems – Most of the conflicts in Olive Oyl’s life are the result of her fickleness and penchant for giving the hopeless Bluto chance after chance to win her affections. Even the Flightiest People Can Eventually Calm Down – Despite all of her fickleness and flighty ways in her youth, later incarnations of Olive Oyl depicted a calmed down, happily-married version of the character. This can serve as a lesson that, with time, even the most childish people learn to grow up. 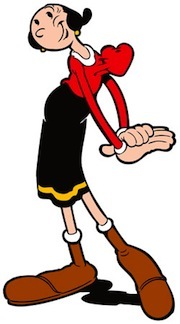 Olive Oyl is one of those cartoon characters that was continually evolving with time. Watching that transformation over through the years can be one of the benefits of viewing both the older and more current versions of the Popeye cartoons.